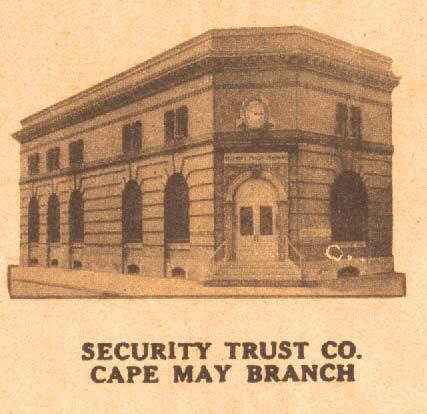 The New Jersey Safe and Trust Company was first organized November 10, 1886 and incorporated under an act of the New Jersey Legislature approved April 6, 1886. The building was erected in 1886. 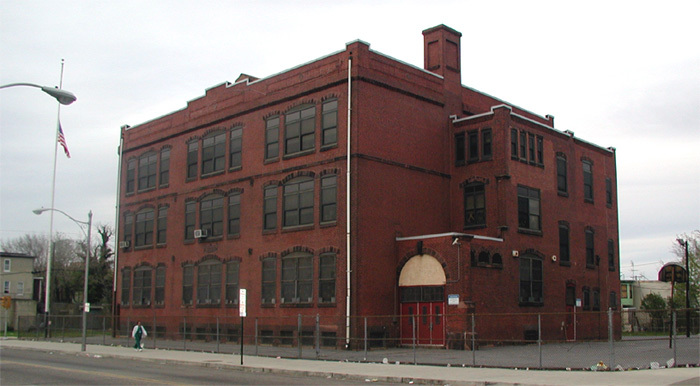 The architect, Arthur Truscott, who lived around the corner at 415 Cooper Street, had also built a school in Camden in 1886, and designed other significant building in Camden. The Late Victorian Eclectic architectural style tower of magnificence was influential to the economics and architectural-style of the downtown Camden area and its development through the years. The building housed a bank up until 1949. 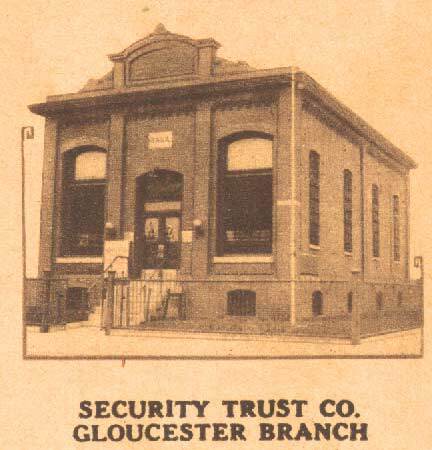 The Security Trust Company organized in 1892. 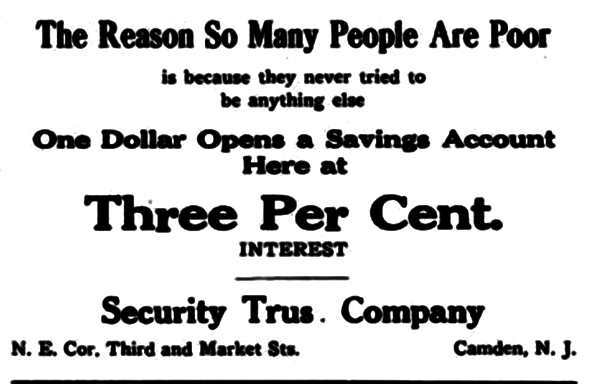 Its assets were purchased by Vineland Safe Deposit December 1902. 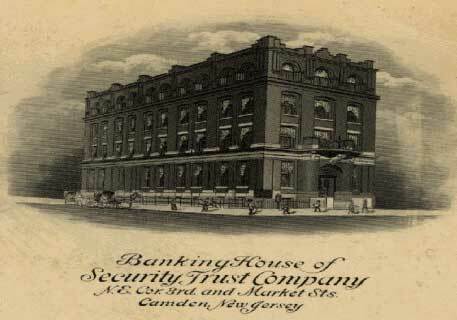 West Jersey Trust organized in 1906, and banking business was conducted under the name Security Trust for many years. 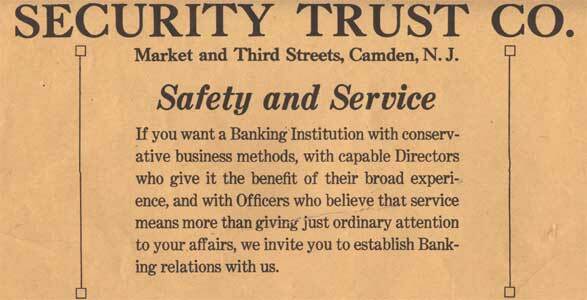 Banking operations ceased in 1949. Prominent Camden lawyers Samuel J.T. French Sr. and Samuel T.J. French Jr. maintained offices in the building over at least six decades, their firm finally closing down in the 1970s. 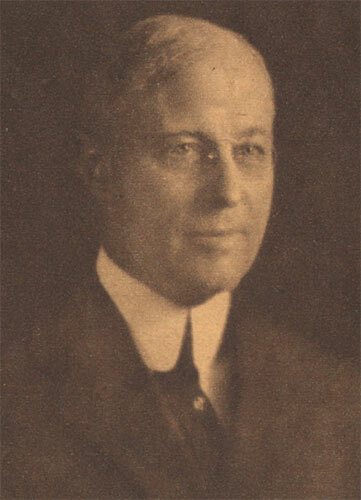 Lawyer S. Conrad Ott also utilized the building from 1906 into the early 1920s. The building was also the home of the Burd Wallpaper & Floorcovering Company in the 1950s, 60s, and 70s. 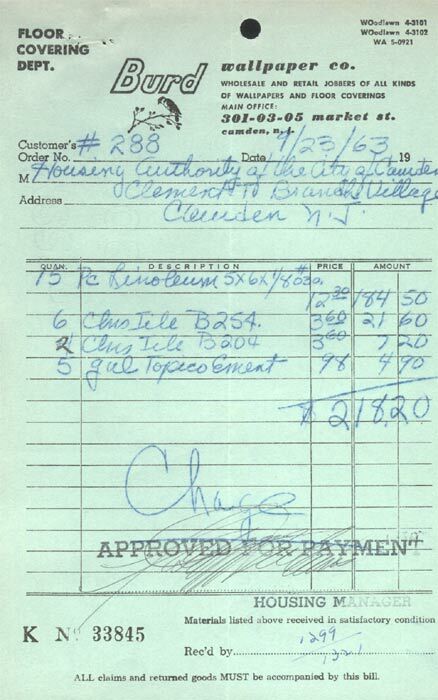 It was owned by the Parking Authority of the City of Camden for a period of time thereafter. The Security Trust Building was added to the National Register of Historic Places in 1990. In 2001, A local firm revealed plans for restoring the building for use as an outdoor cafe and office space, but were unable to go forth with the project. As of September 2003, a new partnership, The Edward S Brown Group, had been formed, and obtained their Commercial Option Agreement from the City of Camden. The post office uses 301 Market Street for mail, but when you research any documents through the city, county or Library of Congress the proper address is 100 North 3rd Street. This address is evidenced on the glass windows and doors of the building. 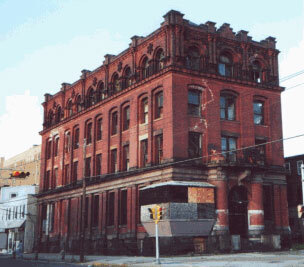 Located at the northeast corner of North 3rd and Market Streets in Camden NJ, the structure rests on a bed of North River slabs; upper story walls are brick. This stone foundation has five floors, each floor measures 78' x 101'; the first floor was built of iron and masonry. The basement is a sum of various caverns with windows, the first floor includes approximately 9-10 iron pillars and brick arches holding the twenty-five feet ceiling, it still has a vault on the first floor made of heavy North River flagstone, lined with iron and steel, a marble fireplace flanked by lions' head accents the first floor; attached is a small building which measures 29' x 25' x 3' once used as a special reading room for the ladies, and a large Directors' room with another fireplace. All the stairways are made of white marble and still have its original oak French-doors. At the foyer of the building is an original, raw iron elevator with lever. There are the initials N J S D T Co at the front entrance, which stands for the name of the building. The exterior of the facade consists of seven heads with crowns and two heads with inscibed names; five stars, and 20 clam shells. The words on the older man "Prudentia" is French meaning honor, virtue, duty; on the younger man "Audentia" is Italian meaning boldness and courage; the seven women with crowns symbolize the 'Seven Deadly Sins'; the Stars of David are for protection; and the clams hold the jewels that lay within. A bay window was added at a later date, more than likely when the Burd Wallpaper Company was operating its retail wallpaper business there. 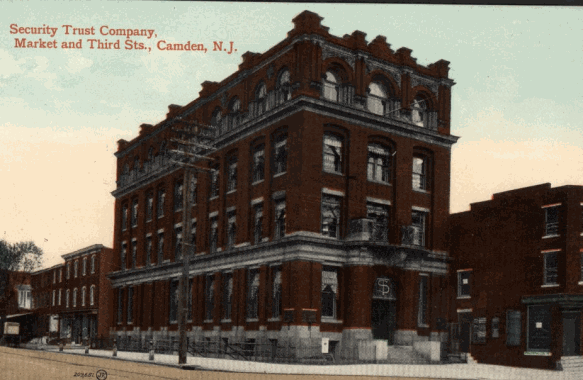 The Burd Wallpaper Company, also known as the Burd Wallpaper and Floorcovering Company, operated for many years in the building at 301-03-05 Market Street in Camden NJ. 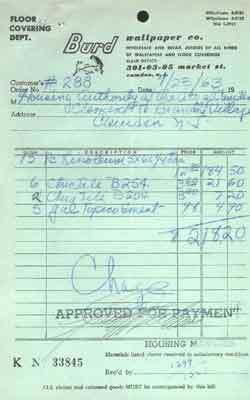 The company sold all kinds of wallpaper and floor coverings such as linoleum and tile to both wholesale and retail customers, contractors, and governmental organizations. The 1886 Victorian-style Security Trust Building in downtown Camden that will soon reopen as affordable senior apartments was honored in Trenton this week for merging green technologies with historic preservation efforts. The bank was among nine sites around the state that received awards from the Department of Environmental Protection's Historic Preservation Office and the New Jersey Historic Sites Council. "It could easily have been demolished and it probably would have been cheaper to do so, but in the long run I think it's going to have a significant impact on the feel of downtown Camden," said Kevin Kavanaugh, vice president of development for RPM Development. RPM managed the reconstruction of the bank as well as a companion apartment complex in Fairview. Altogether, the $23.4 million Market Fair project adds 71 units of affordable senior housing to the city. The construction costs are expected to be repaid through city and state grants, some of which will be derived from the sale of senior housing tax credits to private investors. The Fairview building at 1250 Collings Road, which is new construction, opened in April. All 36 units will be occupied by next week, Kavanaugh said. Workers are finishing up the interiors of the five-story bank building at 301 Market St. and it should be ready for tenants by July, Kavanaugh said. Both buildings were outfitted with energy-efficient appliances, high-performance insulation and other green features that are expected to qualify them as the city's first LEED-certified buildings. The state credited RPM for preserving a slice of history that many people had considered beyond saving. In the 1990s, Preservation New Jersey, a preservation advocacy group, had even listed the Security Trust Building as one of the top 10 most endangered historic sites in the state. Though the building had deteriorated after remaining vacant for more than 35 years, RPM was able to restore the original first-floor vault, white marble lobby floors, decorative iron work and some brick arches. RPM Development is accepting applications for those interested in leasing a one- or two-bedroom apartment at the historic building. To be eligible, at least one renter must be 55 or older and earn between $14,914 and $42,000. Rents are expected to range from $435 to $640 a month. For additional information, call (856) 541-6012 or visit www.marketfairseniorhousing. com. The period between 1870s to the late 1890s can be considered a transitory period in the history of Philadelphia architecture. It marked the height of late Victorian architecture, reflected in the popularity of the idiosyncratic style of Frank Furness. At the same time, it bore the inception of the Queen Ann style, started by a group of younger architects with Walter Cope, Wilson Eyre and Frank Miles Day in the forefront. Despite the obvious differences between the two styles, there exists a strong historical continuity between them. A look at the biography of a lesser known architect should provide new insights to the old theme. Arthur Truscott did not have an extensive portfolio nor were his designs or writings widely-published. Yet his contribution to the architectural community and architectural education in Philadelphia cannot be slighted, which is reflected in the positions he had held. Arthur Truscott was born December 4, 1858 in St. Austell, Cornwall, England. He was the son of Samuel and Susan Truscott and received his education at Weston House School in St. Austell. Regardless of Truscott's training or education in England, it did not take him long to establish himself as a professional architect in Philadelphia. Unlike most of his contemporaries, Arthur Truscottt did not receive any formal education in architecture nor were he under the tutelage of an architect. He arrived in the United States in May of 1874, and by 1875 was established in the Philadelphia city directories as a clerk in offices at 150 South 4th Street, the same address as that given for Samuel Sloan. During this early period Truscott's home was in Camden, NJ, and he maintained a residence in New Jersey for the rest of his life although his office was always in Philadelphia. 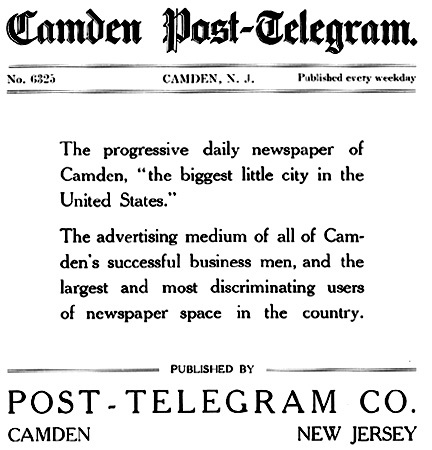 He appears in the Camden City Directories at 415 Cooper Street from 1887 through 1889. Like many young architects, Arthur Truscott moved from office to office, gaining experience and design training. In the case of Truscott, the firms providing his training are among the best in late nineteenth-century Philadelphia. By 1877 he had begun work for Theophilus Parsons Chandler, with whom he remained until 1883. By 1880, Truscott was elected a junior member of the Philadelphia chapter of the American Institute of Architects. In 1883 he moved to the office of Wilson Bros. & Co., lasting there for four years before transferring to another well-known Philadelphia firm, Cope & Stewardson. These early years were fruitful ones for Truscott: he published his own residential designs in Godey's Lady's Book during 1885-86 and also won, with Walter Cope, the year's record for prizes in the T-Square Club competitions in l886. The influence of Theophilus P. Chandler, who was well-known for his English Decorated Gothic style characterized by its historical accuracy , on Truscott is evidenced by his preference for the Gothic style throughout his career. Truscott was clearly proficient in Gothic design when he left Chandler's office to join the Wilson Brothers and Co., but the year of his leaving is unclear. While the city directories have in records the year as 1883, he was supposed to be involved in the design of the Broad Street Station, which was a project undertaken by Wilson Brothers and Co. in 1881. At that period of time, the architectural and engineering firm specialized in railroad design and engineering work, and Truscott was hired as John M. Wilson's Gothic designer . In the design of Broad Street Station, it is difficult to determine if his role as a designer was limited to designing the details of the facade or it extended to designing an asymmetrical and non-axial plan itself. However, the treatment of the interior and the exterior of Broad Street Station reveals influences of the theories of Viollet-le-duc and John Ruskin. The Gothic style was no longer simply an architectural style, it was also used as a communicative tool to express architectural space. It is almost ironical to note Arthur Truscott's concurrent interest in the Arts and Crafts movement when he was working with Wilson Brothers and Co.. In 1883, Truscott was part of the group of architects, who were dedicated to promoting the Arts and Crafts movement in America, to have founded the T-Square Club. Other founding members included Frank Miles Day, Walter Cope and Wilson Eyre. 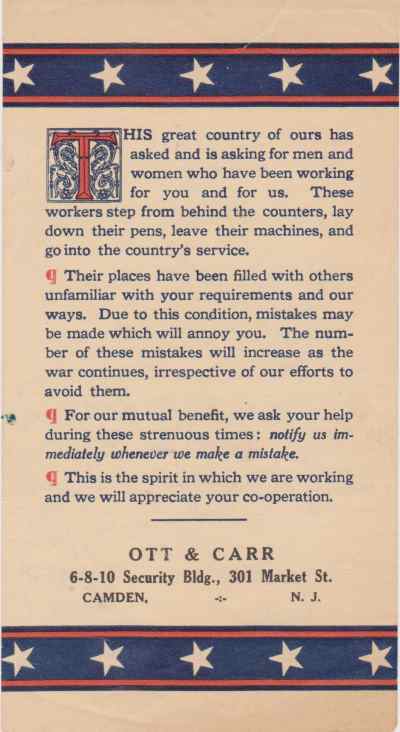 As a means to promote its cause, the T-Square Club published catalogues and organized exhibitions and competitions . In fact, Truscott had won prizes in those competitions with Walter Cope. Truscott's commitment to the T-Square Club was further demonstrated by his appointment to the position of vice-president. Although there is no surviving prints of his winning designs, one can safely conclude that Truscott was designing in the Queen Ann style, which was the characteristic style of the Arts and Crafts movement. This is further confirmed by the publication of his designs in the catalogue, Godey's Lady's Book. The catalogue was a source book for popular consumption, with its main focus on house designs. Since the publisher hired only one chief architect to contribute, Truscott had to be an architect of note to have been one of the contributors. When Truscott was one of its contributors, the popularity of the Queen Anne style was on the rise . Apparently, Truscott's growing interest in domestic architecture conflicted with Wilson Brothers and Co.'s interest in industrial architecture. In 1887, Truscott joined Cope & Stewardson, which eventually became well-known for their Collegiate Gothic architecture. It was only now that Truscott received individual projects, for e.g. the construction of a public school in Camden, New Jersey, in 1886. Truscott was finally recognized as an architect in his own right when he was elected as a professional member of the American Institute of Architects in 1889. 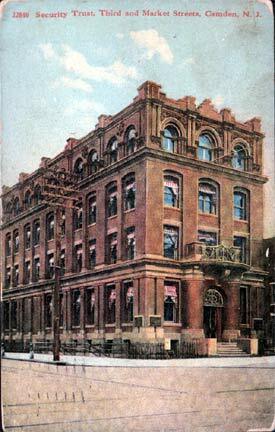 While at Cope and Stewarson, Truscott was involved in the design and building of several Camden buildings, including the New Jersey Safe and Trust Company in 1886, the Broadway Elementary School at Broadway and Clinton Street in 1886, and the Camden Post newspaper building at the northeast corner of Front and Federal Streets, which broke ground in 1887. 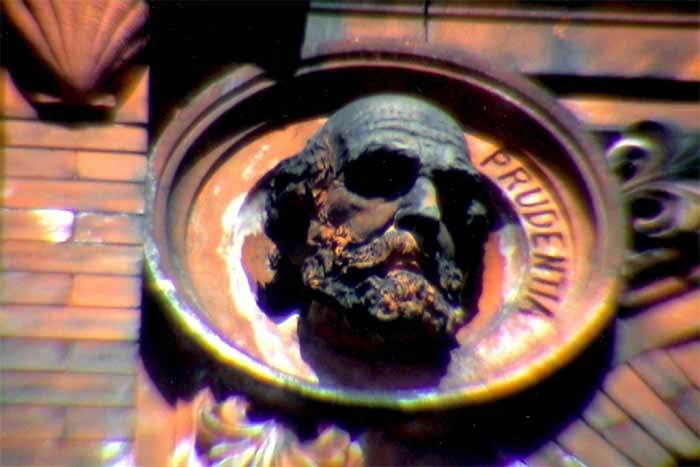 He also was involved with the Girard Life Insurance Building in Philadelphia in 1887. Arthur Truscott left Cope & Stewardson in 1890 to establish his own architecture firm, which was a short-lived attempt. Truscott established his firm and soon went to Columbia, TN, where he was engaged in the construction of an arsenal. Upon his return, he entered practice with William Lloyd Baily under the name Baily & Truscott, with offices at 138 South 4th Street. 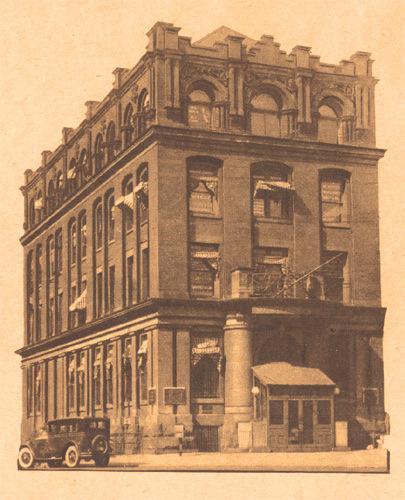 Among his more significant projects was the Beasley Building at 1125-31, Walnut Street, Philadelphia, Pennsylvania. The law office was built in 1894, in the Gothic style. To compare this building with McKim, Mead & White's Boston Public Library (1888-95) may seem incredulous for the two buildings are built in completely different styles. But the fact that Beasley Building is atypical of Gothic architecture reveals it as an attempt to refer to something outside of historicity. Moreover, the proximity of their dates and location, and their similar Academic treatment of the styles that both buildings provide an interesting comparison. Like the Boston Public Library, Truscott used smoothened, light-colored stone to give the Beasley Building a homogenous texture that cohered the building as a whole, which was the main principle in design. There is also a corresponding treatment of details in both buildings. Not only were details more sparse, they were also flatter, reinforcing the planar surface of the building. However, the twin gables of the Beasley Building is an exaggerated attempt to emphasize the planar surface. In spite of the Beasley Building's asymmetry, the central axis of the plan is betrayed by the centrally-positioned entrance. Needless to mention, it was an attempt to incorporate the Gothic asymmetry in the strong axial plan of the Boston Public Library. In 1899 Arthur Truscott designed another Camden landmark, the Camden Fire Insurance Association Building on Federal Street. He was retained again in 1904 when renovations were made to the structure. The partnership with Baily was dissolved in 1904. Between 1904 and 1911, there was a hiatus in Truscott's career in Philadelphia. When he returned in 1911, he was employed as an instructor at Drexel Institute. He was the head of the School of Architecture program until 1913, and he was transferred to the Department of Engineering. Arthur Truscott was the architect in 1920 when renovations were made to the Camden Fire Insurance Association Building on Federal Street which he had designed two decades earlier. Described by E. D. McDonald as "a modest and kindly gentleman, an able and sensitive designer," Truscott conveyed his influence to a number of younger architects who indicate in their Philadelphia Chapter, AIA, applications that they have studied either with him or in the atelier which John Dull administered at Drexel. Although many young architects in Philadelphia would pass through the University of Pennsylvania and the hands of Paul P. Cret, others would choose either the day or evening program at Drexel. Still others would select the T-Square Club atelier or that atelier in combination with the Drexel program. Truscott's involvement with both Drexel and the T-Square Club proves both his own commitment to architectural education and Philadelphia's variety of educational paths for the would-be architect. Truscott's last appearance in the Philadelphia city directories was in 1930. 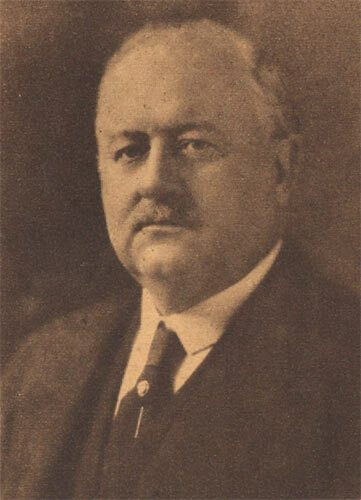 The years following Truscott's Drexel stint continue to be unexplained; however, as he was a Camden resident it is evident that he was active in projects in New Jersey. His last citation in the Philadelphia city directories is in 1930, when he is noted as a draftsman in the office of Charles W. Bolton & Son, specialists in church architecture. At the time of the April 1930 Federal census, Arthur Truscott was living in a home he owned with his wife Alice P. Truscott at 19 Springfield Avenue in Merchantville NJ. Also living there at the time were son A. Stanley Truscott, a veteran of World War I, and daughter Alice "Ailsie" Truscott. 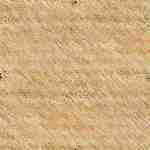 The lack of information is a severe limitation on the development of themes. Because there is no additional information about the circumstances surrounding his transitory appointments in various offices, one can only assume that Truscott left at his own will to set up his own firm. However, the assumption fails to take into account the economic forces. Hence, it is difficult to ascertain the impact of economic forces on the individual architect's career and on the profession. Another theme incipient in the narration of Truscott's story is the relationship between the architect and the client. Especially when the clients tended to be more educated in popular architecture, with the proliferation of domestic architecture. As well as his importance in the field of architectural education, Truscott's commitment to the professional organizations of architecture deserves mention. He was one of the founding members of Philadelphia's T-Square Club in 1883 and served as vice-president for that organization in 1887. 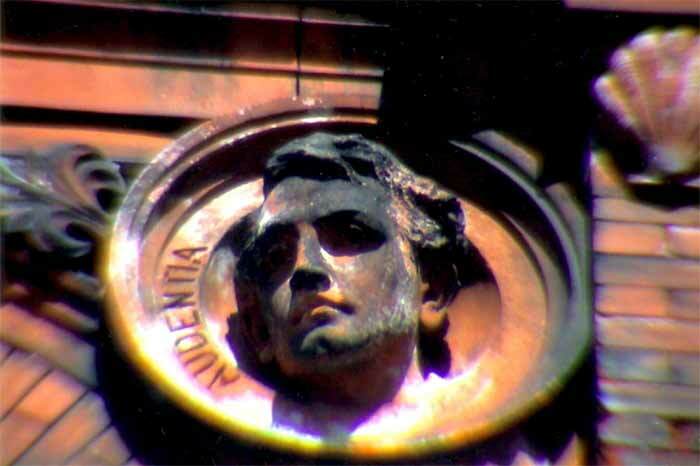 He was elected a junior member of the Philadelphia Chapter of the AIA in 1880 and became a professional member in 1889. Arthur Truscott passed away on September 12, 1938 in Blackwood NJ. He was survived by his wife, son Wilson, and daughters Alice and Katherine. He was preceded in death by his son A. Stanley Truscott, who had died in Merchantville NJ on October 27, 1935. The primary source of Arthur Truscott's biographical data is Sandra Tatman and G.K.Hall's Biographical Dictionary of Philadelphia Architects. Other secondary sources included Theo White's Philadelphia Architecture in the Nineteenth Century, Philadelphia Architecture: A Guide to the City published by the American Institute of Architects and George Hersey's essay in the Journal Of Society of Architectural Historians (1959), titled 'Godey's Choice'; and Otto C. Wolf's Breweries And Allied or Auxiliary Buildings. Philadelphia: 1906..
Also used on-line sources via www.ancestry.com including the 1930 Federal census and Ancestry World Tee entries for Arthur Ttruscott, and an article about Truscott at www.brynmawr.edu/Acads/cities/96-city255/pap2/ltpap2.html by Professor Jeffrey Cohen.